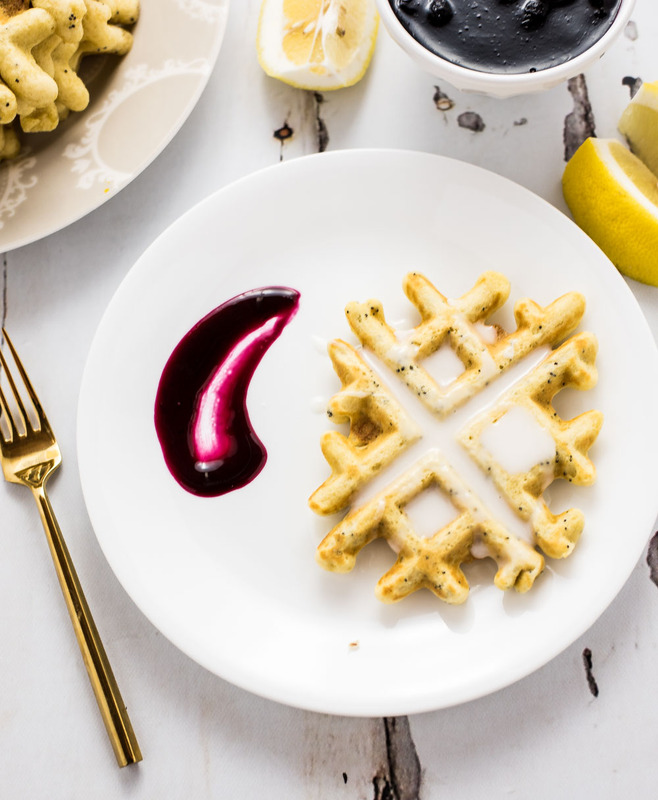 Start your day with these lemon poppy seed waffles with blueberry sauce! They will be a crowd pleaser at any breakfast or brunch gathering! A simple buttermilk waffle batter is livened up with poppy seeds, lemon juice, and lemon zest. The waffles are then topped with a simple lemon-flavored glazed and homemade blueberry sauce. 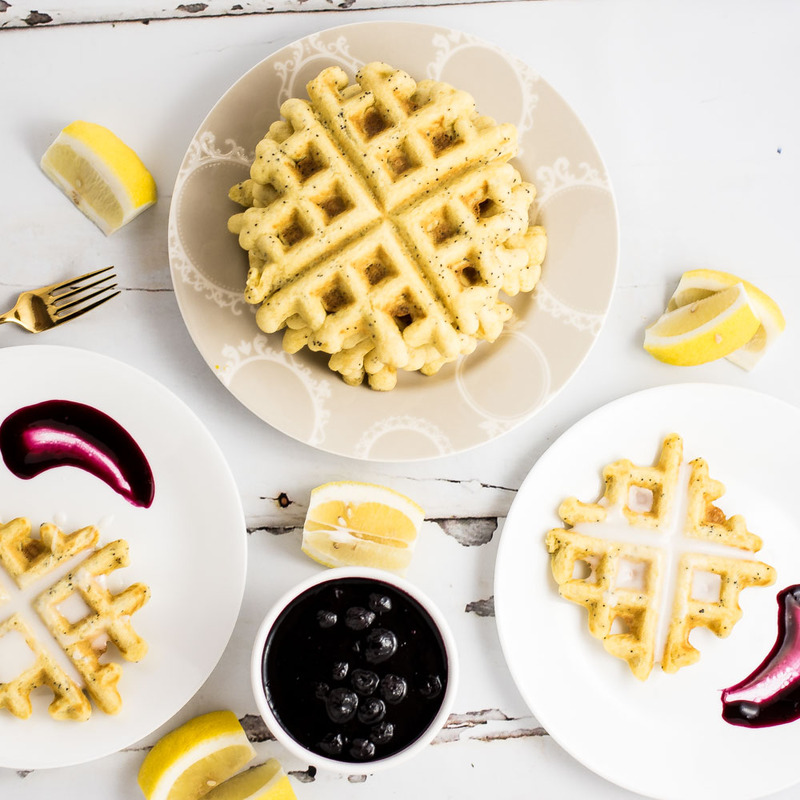 These lemon poppy seed waffles are the perfect summer treat! There are some flavors that I just associate with summer and lemon is one of them. I know. I know. The summertime isn't necessarily known for being citrus season (in most parts of the USA), but I just think there's something about lemon that reminds me of summer. Maybe it's because lemonade tends to be everywhere you look. Lemonade is so refreshing, and maybe it's the brightness? Lemon-flavored things are just so bright. I think that's the perfect way to describe these waffles: bright. Also...blueberries are totally "summer," and blueberries totally make these waffles shine. 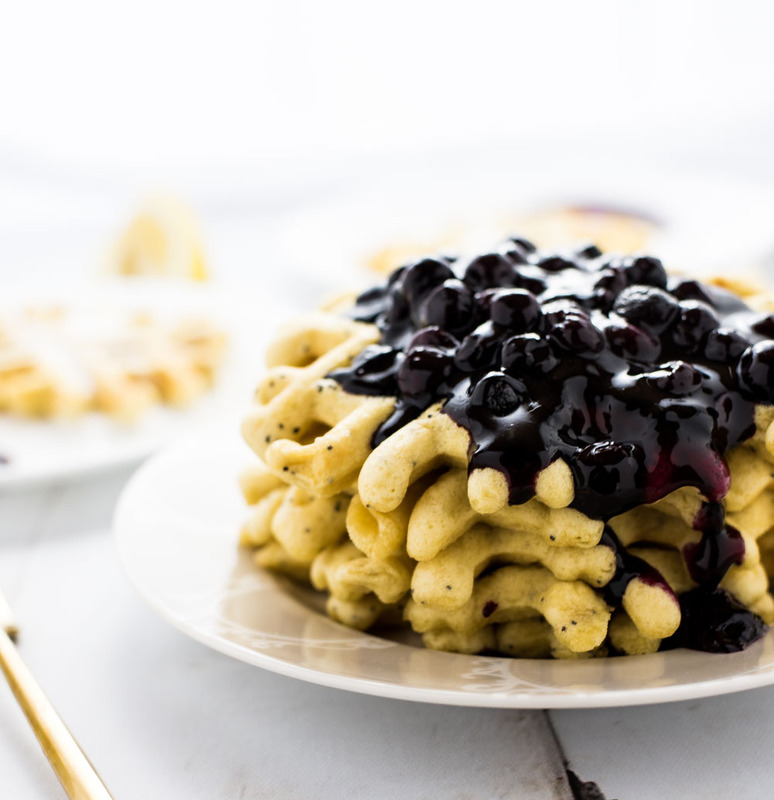 When I was thinking of a way to separate these lemon/poppy seed/blueberry waffles apart from the rest, I found that there were SO many waffles out there with this flavor combination! I decided to put my own spin on them by leaving the blueberries out of the waffles, and making a simple blueberry sauce to throw on top instead. I also am a firm believer that everything, apart from maybe roast beef, deserves a little sugar drizzled on top. The lemon glaze in this recipe really makes these waffles pop. 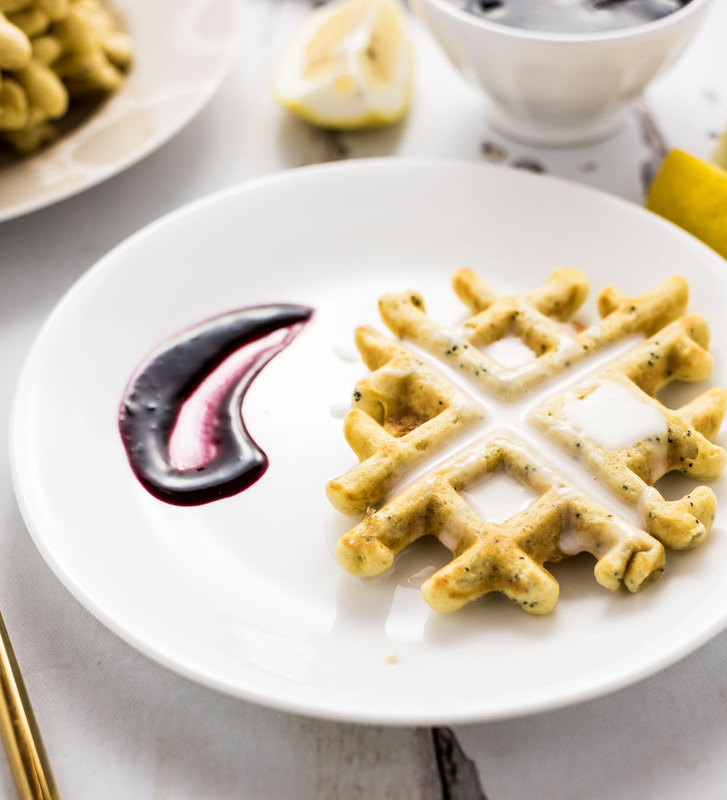 These lemon poppy seed waffles are a must-make at some point this summer, or even throughout the rest of the year! Pair them with a farmhouse ale. It will really make that lemon flavor pop! Enjoy! Add the blueberries, water, and granulated sugar to a medium saucepan set over medium heat. Bring to a light boil (or heavy simmer). Mix the cornstarch with 2 tablespoons water until dissolved. Slowly stir the cornstarch mixture into the blueberry mixture. Reduce the heat to medium low and cook for about 15 minutes or until the sauce has thickened substantially. Stir in the vanilla extract and lemon juice and decrease the heat to the lowest setting possible. Keep warm until you are ready to serve. In a large bowl, whisk together the buttermilk, whole milk, melted coconut oil, eggs, vanilla extract and lemon juice. Set aside. In another bowl, whisk together the flours, cornstarch, baking powder, brown sugar, salt, lemon zest, and poppy seeds. Add the dry ingredients to the wet and fold the ingredients together until just moistened. Set aside for about 3-5 minutes while you prepare the glaze. Whisk the confectioner's sugar, lemon juice, milk, and salt together in a small bowl. Set aside. Grease your waffle iron, and add about 1/4-1/3 cup of the waffle batter depending on the size of your iron. Cook until done and then repeat for the rest of your batter. Don't forget to grease your waffle iron each time you make a waffle. 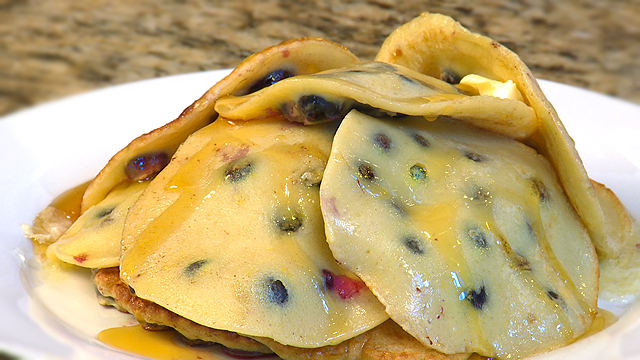 To serve, drizzle the lemon glaze on top of a waffle and top with the blueberry sauce. Enjoy immediately!